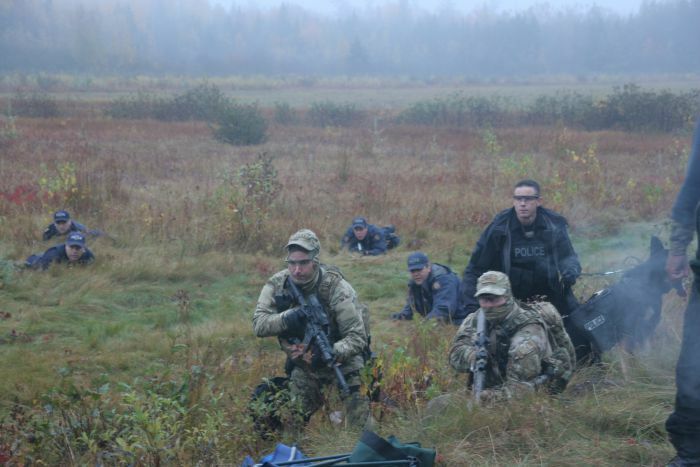 KJIPUKTUK (Halifax) -- An Access to Information request has revealed that during the course of anti-shale gas protests in New Brunswick in 2013, 5th Canadian Division Support Base (CDSB) Gagetown, Eastern Canada's largest military facility, was contacted on two separate occasions by high ranking members of the Mi’kmaq Warrior Society. On each occasion, the Warrior Society – one of the key strategic groups involved in the on-the-ground protests that would ultimately see 100 activists arrested - requested negotiators from the Canadian Armed Forces, citing a breakdown in trust and an increasingly toxic working relationship with the Royal Canadian Mounted Police (RCMP). In both their communications with 5th CDSB, the Warrior Society would claim that military negotiating assistance was their right, based on a centuries-old treaty signed between the British Crown and the Mi'kmaq nation. Each request, however, was subsequently refused by the Canadian Armed Forces. This, despite the fact that Chief and Council of Elsipogtog First Nation – who themselves were signed into the AFNCNB's consultative 'umbrella' at the time - had formally requested the assistance of the Warrior Society as far back as June, 2013. Formalizing the request in writing, Chief and Council had signed a Band Council Resolution (BCR) to this effect. According to the internal documents we have obtained, the first Warrior Society request for military assistance came on the afternoon of July 28th, 2013. The prior evening, July 27th, had seen a heated and protracted stand-off, deep in the Kent County, New Brunswick, woods, between local activists and the Mi'kmaq Warrior Society on one side, and the RCMP and SWN workers on the other. A crossroads deep in an unpopulated cut-block had been the scene of an eight hour blockade, where negotiations between the RCMP and activists had seriously deteriorated. On the afternoon of July 28th, returning to the scene of the previous evening's blockade, “a few dozen protesters” as well as “approximately 12 RCMP officers” - according to the documents – once again stood face to face. At this point, a representative of the Warrior Society, whose name has been redacted from the documents but who has since been identified as Warrior Society 'General' Jim Pictou, first contacted Master Corporal MacLeod, a military police officer from 5th CDSB Gagetown. Communication between the Warrior Society and 5th CDSB was subsequently passed to the commanding officer of Gagetown's military police, Captain Dupuis. In a subsequent conversation, Dupuis noted that Pictou told him that there were over “200 RCMP members currently located at Salmon River Road”, the current site of the standoff, and that the RCMP had arrested or assaulted approximately 30 first nations women on the 27th. Contact was then established between Dupuis and Inspector Kevin Leahy of the RCMP's Shale Gas Unit in New Brunswick. Leahy informed Dupuis that the current situation was under control. Several emails detailing the events, along with a 'Ministerial Advisory', were subsequently sent from 5th CDSB to representatives of the Canadian Navy, Airforce, numerous addresses at the Department of National Defence headquarters, as well as the Public Affairs department in Washington, D.C.
Was the Mi'kmaq Warrior Society representative? In answering this question, Jim Pictou tells the Halifax Media Co-op that the assistance of the Warrior Society was formally requested by Chief and Council of Elsipogtog First Nation, and that this request exists in a formal 'Band Council Resolution', dated from late June, 2013. For the AFNCNB to then tell 5th CDSB Gagetown that the Warrior Society is “not representative”, is, to Pictou, flat wrong. Importantly, access to the Treaty of 1752 is for all Mi'kmaq. Prior, successful, legal challenges have come from individuals seeking recourse against Crown law, not from Indian Act representatives, such as reservation Chiefs and Councils, or the incorporated bodies that they form of their own accord, such as the AFNCNB. For the AFNCNB to instruct the Canadian Armed Forces that Jim Pictou and the Mi'kmaq Warrior Society were not representative of any other First Nations people, or that they weren't elected, hence unimportant, is arguably to deny these individuals their treaty rights. This goes beyond the purview of the AFNCNB, as legal precedent has shown that these treaty rights are self-contained within the individual and are not concentrated within the Indian Act or its representatives. At what point could the RCMP be justifiably perceived as simply being hired escorts for SWN's seismic testing? New Brunswickers had, after all, petitioned by the tens of thousands to demand a moratorium on hydraulic fracturing in their province. Miles Howe is the author of 'Debriefing Elsipogtog - The Anatomy of a Struggle', available through Fernwood Publishing.